A frustrated bank customer doused himself in petrol and threatened to set fire to himself inside a branch when his payments were blocked. Jason Duncan-King, 51, returned to the bank with a jerrycan hidden in a shopping bag before pouring petrol over himself and the counter. A terrified member of bank staff also had petrol poured on them while others slipped on the liquid and suffered minor injuries. Duncan-King had matches in his hand when police arrived and snatched them from him. His rampage caused £11,000 worth of damage at the Metro Bank branch in Bromley, south east London. Duncan-King, of Sevenoaks, Kent, admitted attempted arson being reckless as to whether life would be endangered when he appeared in Croydon Crown Court last month. He was jailed for three and-a-half years when he appeared at the same court for sentencing yesterday (THRS). CCTV showed Duncan-King wearing a drench shirt and pouring the green can of petrol directly onto computer equipment during his rampage. He walked into the bank on Bromley High Street on October 16 last year to dispute a payment which had been blocked from his account, the court heard. But the dispute quickly escalated when he threatened staff and declared he didn’t know what he was capable of doing next. He returned an hour later carrying a petrol can and matches. 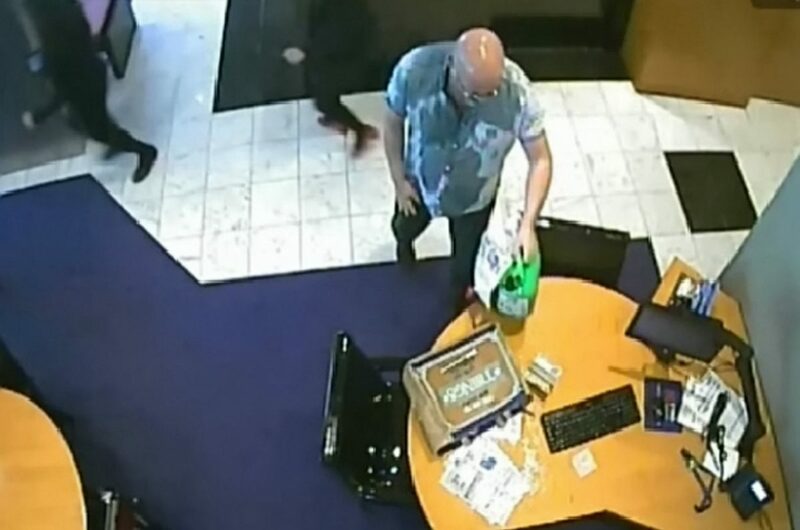 After being told to leave the busy bank by a member of staff, he drenched himself in petrol and poured the flammable substance all over the store – including on a computer, counter and across the floor. When officers arrived at the bank, Duncan-King was stood in a puddle of petrol with matches in his hand. Detective Constable Jamie Kirby, from South Area CID, said: “The officers who first attended the scene showed extreme bravery and put the safety of staff and customers before themselves.